AT THE END OF World War II (1939–45), Europe lay in wasted ruin with most industrial and transportation infrastructure damaged or destroyed. Some 40 million deaths had occurred in Europe and RUSSIA in the six years of conflict. Approximately 25 million displaced persons were stranded far from original homelands with little resources. The UNITED STATES and its allies were eager to return to a national lifestyle of peace and sought to rapidly demobilize the vast military might they had built up over the years of the war. Men in uniform wanted to return to jobs, education, and opportunities and those at home yearned for the hard won fruits that victory was promised to bring. The scars of war were evident across the landscape of Europe and the human costs of death, disruption, and dislocation cut deep into the heart of every nation. The Soviet Union declined to demobilize and decided to maintain the vast armies and military might that had occupied Eastern Europe and portions of Central Europe. Efforts by the Allies of WWII to address the rebuilding and reorganization of Europe soon polarized. The Soviets encouraged government changes in areas they occupied to follow socialist or communist patterns. In the west, America, Britain, and FRANCE supported a return to democratic forms of government. Within the areas of Soviet influence, imposition of pro-Soviet undemocratic forms of government became the norm. By the end of 1947, Polish elections had been canceled, the elected prime minister of BULGARIA was forced out of the country, and the People’s Republic of ROMANIA was formed. A call to worldwide communist revolution stirred fears of aggression from without and subversion from within. Soon after the conclusion of the war, as Europe struggled to recover, political events boded ill for a lasting peace. The Soviets made demands of NORWAY, GREECE, and TURKEY that were seen by Western Europe as direct threats to these nations’ sovereignty. BELGIUM, France, LUXEMBOURG, the NETHERLANDS, and the UNITED KINGDOM joined in the Brussels Treaty of March 1948 to build a mutual system of defense against ideological, political, and military threats to their national futures. The Soviet Union began a blockade of Allied-occupied Berlin in April 1948. Civil war in Greece and the elected government of Czechoslovakia’s overthrow in a communist coup in June 1948 set an ominous backdrop. Within a span of three decades, the United States had chosen to come to the aid of Europe in two major world conflagrations without any treaty obligations to do so. Now America was financially and politically committed to the rebuilding of Europe through the European Recovery Plan (Marshall Plan). The perceived threat of the Soviet Union moved the Western European nations and the United States to formalize their security relationship in the Treaty of Washington signed on April 4, 1949. This, in effect, was the formation of NATO, the charter members being Belgium, CANADA, DENMARK, France, ICELAND, ITALY, Luxembourg, the Netherlands, Norway, PORTUGAL, the United Kingdom, and the United States. The treaty committed the 12 nations to collective defense, meaning that an attack on one was like an attack on all. The North Atlantic Treaty Organization was seen as assurance against military conflict among the agreeing parties, a check to any aggressive German military resurgence, and a clear counter to the military power of the Soviet Union. 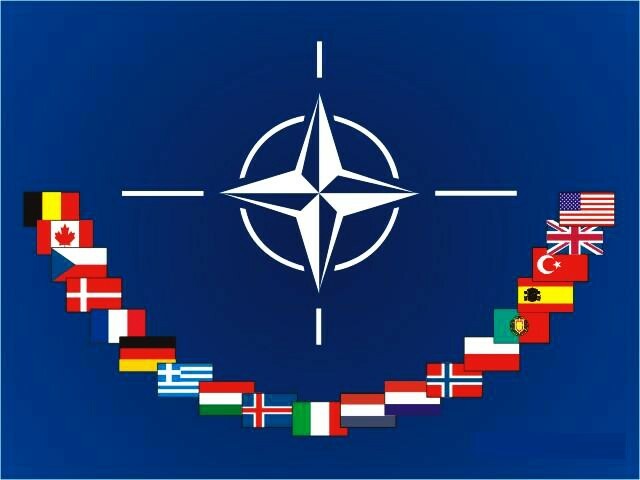 The early years of the NATO alliance were characterized by its growth as an institution, delineation of roles and responsibilities, and integration into the military establishments of the governments of Western Europe. The combined military strengths of the NATO nations were quantitatively inferior to those of the Soviet Union concentrated in Central and Eastern Europe. Consequently, NATO’s nuclear weapons capability became a central component of its military and political strategy of deterrence and containment. NATO expanded in 1955 by allowing the re-armed Federal Republic of GERMANY (West Germany) to join. The Soviet Union saw this as an overt threat to their security and countered by organizing a treaty organization of their own. The Warsaw Pact was signed by ALBANIA, Bulgaria, Czechoslovakia, German Democratic Republic (East Germany), HUNGARY, POLAND, Romania, and the Soviet Union. Now all the actors were assigned for this increasingly dramatic play of international tensions. In 1956, a popular uprising against the communist government in Hungary was quelled by invading Soviet forces. The United Nations condemned this response, but NATO took no actions. In the 1960s, tensions grew in Europe with the building of the Berlin Wall and NATO began to publicly debate the requirement of NATO having direct control of nuclear weapons in the European theater. It was felt that this increased capability and responsiveness would add to the deterrence available to check Soviet-sponsored aggression. After the Cuban Missile Crisis between the United States and the Soviet Union, the Americans gave command and control of nuclear capable forces stationed in Europe to NATO. In 1966, France removed its forces from the military structures of NATO, citing the dominance of the United States in the organization. NATO continued to set the pace for Western military strategy and devised a “First Use” policy, which warned that NATO held the right to use nuclear weapons in response to a conventional military attack against any of its member states. The 1970s saw a time of détente between east and west. The Strategic Arms Limitation Talks (SALT) produced treaties that called for the drastic reduction of nuclear stockpiles. NATO played a critical role in the implementation of agreed-upon conventional forces reductions brought about by the Conference on Security and Co-operation in Europe. The end of that decade saw the Soviet invasion of Afghanistan and a renewed interest by America to match Soviet actions with increases in military readiness, capability, and deployment. NATO sponsored the deployment of nuclear ballistic and cruise missiles into Europe. During these times of increased military activity and general angst, Ronald Regean and Mikhail Gorbachev began a series of summits that changed superpower relations and opened the door to significant arms reduction talks. NATO again became a major implementing agency of these agreements and other confidence-building measures. The late 1980s saw the collapse of Eastern European communist regimes as the Soviet Union withdrew military support and Gorbachev encouraged them to seek political and economical reforms. Long-term economic failures and the overall shift in political climate caused change to sweep across Soviet-dominated Europe. NATO takes credit for acting as a continuous deterrent to Soviet military aggression that finally allowed the breakaway of Eastern Europe and perhaps even the break up of the Soviet Union. The west declared victory in the Cold War as the former Soviet Union dissolved in 1991. The decade of the 1990s saw vast political change in Central and Eastern Europe and the demise of the Soviet Union. Having watched its rivals dissolve, NATO now faced a redefinition of its role and responsibilities. Interim steps were taken to engage the former Warsaw Pact nations through the Partnerships for Peace program, which developed military relations with former adversaries. As Yugoslavia broke up into smaller republics ethnic violence erupted. NATO took on its first ever combat operations as it worked in line with United Nations (UN) resolutions to create conditions for peace in Bosnia by bombing Serbian military forces. NATO nations provided forces for UN-sponsored peacekeeping forces in the former Yugoslavia. The defining of new roles for NATO continued into the new century. The terrorist attacks on the United States in 2001 were considered an issue of mutual defense and NATO elected to join America in its war against terrorism embodied in the invasion of Afghanistan. However, as the United States prepared to invade Iraq in 2003, Germany and France blocked all efforts made to gain the political and military support of NATO for the U.S.-led coalition operation. NATO took over command and coordination of the security in and round Kabul, AFGHANISTAN, in August 2003. This is the first mission outside the Euro-Atlantic area in NATO’s history, and it raises new questions and concerns as to future of the organization. NATO holds to its central concept that it embodies the transatlantic link of Europe’s security and prosperity. It is the concrete expression of the ideal that the security of North America is permanently tied to the security of Europe. The expansion of NATO into Central and Eastern Europe with the new membership of the CZECH REPUBLIC, Hungary, and Poland ties the new identity of NATO to the new identity of Europe. What path that will take is unclear and the outcome remains uncertain. NATO continues to operate a robust organization that provides an unprecedented forum in which members can raise issues of concern regarding their security. It also maintains an institutional structure that supports consultation and cooperation between members in political, military and economic, as well as scientific and other nonmilitary fields. For the foreseeable future NATO will continue to act as an intergovernmental agency that seeks to maintain integrated combined military capability to prevent war, manage crisis, and promote security cooperation in Europe and abroad. NATO’s structure consists of a military and civilian component. The civilian side has four primary components. The North Atlantic Council constitutes the executive body of NATO and is formed by permanent representatives from all members. Decisions reached must be unanimous. The Defense Planning Committee is a consultative body that focuses on development of military plans, it includes permanent members from all member nations except France. The Nuclear Planning Group is comprised of national defense ministers. The Secretary General is appointed by member states and acts as the Chair of the senior committees. NATO’s military structure is built on three areafocused commands. Allied Command Atlantic, Allied Command Europe, and Canada-United Sates Regional Planning Group share the military responsibilities. The United States provides the NATO Supreme Commander.